Chicken Francese- Hello everybody, welcome back with ZetiraKitchen! Today I will share about how to make Chicken Francese. Chicken Francese is an Italian-American dish that popular in Rochester, New York. When Italian immigrants arrived in Rochester, they brought their recipes with them. Chicken Francese has easy method that you can make in your home. 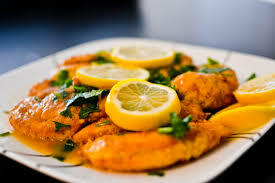 Prepare chicken breats then dip on egg, covered with flour, then sautéed chicken cutlets with a lemon-butter and if you like add some white wine in sauce for a better taste. Heat the oil over large saute pan. Beat the eggs then dip the chicken breasts in eggs beat. Dust each breast with seasoned flour (salt and white pepper) on all side. Put the chicken breast into hot oil, set the heat to medium and fry in 3 to 4 minutes or until golden brown. Flip and repeat cooking for a final 3 to 4 minutes then drain it. On the same pan, heat the pan and add the stock. let it until boiled then reduce 3/4 of the volume. Add the butter and stirring to make a sauce. Move the pan from the heat. Give the lemon juice and parsley on sauce.